This story begins with a proposal. You may not know, gentle reader, but I’ve recently become engaged. This is thrilling and unnerving, as I’m not a person who has spent much time contemplating my wedding. The probability of unicorns and the apocalypse? Yes. The necessity for monogrammed linens? No. So I’ve coined the #haplessbride hashtag on Twitter to bookend any wild-eyed/delirious assertions on my part regarding venue acquisition, invitation printing or any other foreign concept. I’ve also created a group board on Pinterest: The Hapless Bride: For the Connubially Clueless. If you’re on Pinterest or would like to be, drop me a comment here and I’ll add you. I have invited all my friends to contribute ideas to make my wedding the most eccentric– sorry, most glamorous ever. Now to the mortifying bit. Like many people, I have allowed my love of Chinese food, Oreos and red cream soda to overtake my common sense. The equation is simple: junk food + soda + lazy lolling = sadface. I now face the terrifyingly inevitable WEDDING DRESS TRY-ON. I peered in the full-length mirror yesterday and shouted something that cannot be reprinted on this blog (hint: rhymes with goalie schmuck). SOMETHING NEEDS MUST BE DONE. I’ve been pondering motivational tools. I love being fit, but inertia is more powerful especially when work and family and wedding planning interfere. I am a big fan of goal setting, so this appealed. I am also a fan of zombies. Well, evading zombies. I added another layer to #ZAP today. So I went out today and ran 2.79 km. Not a particularly impressive start, but considering the extent of my exercise has been walking to my car, I’m rather jazzed. For people with an overactive imagination (such as myself), this app is definitely alarming. Imagine running around your suburban neighborhood at just before twilight. Almost no one is out. All the lawns are manicured, the sprinklers are running, the televisions blare unwatched. Perfect scenario for a zombie apocalypse. Cue muffled groans and shuffling feet. I did return from my mission successful, ruddy-cheeked and unbitten. If anyone is curious, this is my first End of World Playlist. So thanks to Emmie for being a motivational rock star. She’s #ZAP team captain. I’m first mate. Anyone else in? You’ll want us on your team at the end of the world. WANTED: Family-friendly book of kid quips and anecdotes seeks beta readers. Must be willing to have your funny bone tickled and your heart touched. Cynics need not apply. Spanning several decades, “Hello, You Freaks!” is a charming, heartfelt read. Perfect for lovers of Erma Bombeck’s humor, Chicken Soup for the Soul and American’s Funniest Home Videos. I actually snorted out loud several times while reading it. The book still is in the process of correcting some minor formatting issues and will be getting a new cover, but the authors want your feedback. Willing to help out indie authors and take the challenge? When you go to check out, enter coupon code: KP32C. You can then download it free in any format: HTML, for Kindle or for Nook. This code expires September 21, 2012, so be sure to go snag your free copy now. Once you’ve read it, let me know what you think – jot me a quick note at annabbps at gmail dot com. I’ll forward your feedback to the authors. Thanks so much in advance for your thoughts! As I continue to chip away doggedly at #Blogflash2012, I will say I enjoy taking a word and spinning it in a non-obvious direction. Today is her wedding day. They wove roses in her hair. They scattered fragrant petals in her wake, singing songs of celebration. Her heart swelled when Grandmother blessed them. Then the raiders came. Songs became shouts. Acrid smoke filled the air as the chapel burned. Everyone was gone. 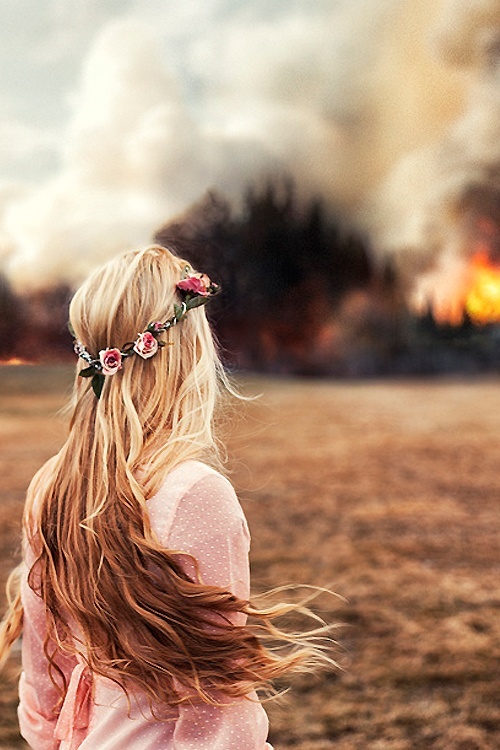 She stood alone on the outskirts of her village and watched it burn. She smelled crushed rose petals. Today was her wedding day. And tonight she would weave roses in his shroud. This post is in honor of Meg McNulty (@charitygirlblog), Classicist and secret goddess, who shares my love of mythology. I always thought there might be another side of the Danaë myth. Here’s my version. Every morning, sun reflected off the sill of her bronze tower, warming her face. Today, a shower of gold flakes floated down and manifested into a man’s shape. His voice was like thunder, yet his hands were gentle, countless gold flakes brushing her skin. Before long, Danaë was with child. She gathered handfuls of gold flakes and scattered her hair, greedily rubbing them across her belly. One day, he looked in her eyes and saw only the reflection of the gold. As he fled, the gold flakes melted in the sun like snow. Her despairing cries followed him to Olympus. 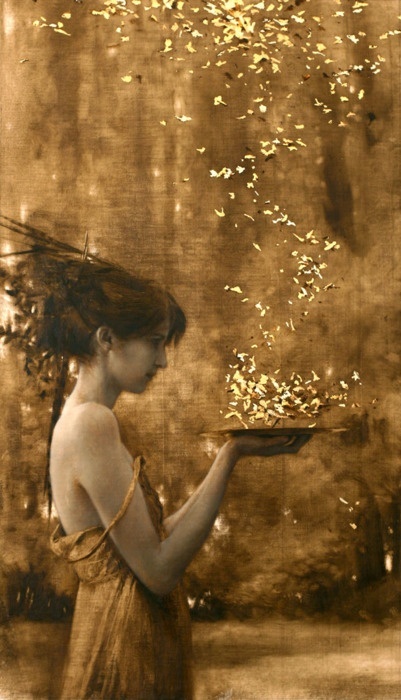 Art by Brad Kunkle, “Two Suns,” Oil and Gold leaf on canvas – All rights reserved. This Blogflash 2012 entry proves not all success is positive. Elidia chanted the prophecy; it left a galling taste in her mouth, like the arsenic creams used to whiten her skin. Whiter, whitest, still the furrows in her face deepened. She’d been the beauty, married the King. But Time, inexorable, curved creases round her mouth. 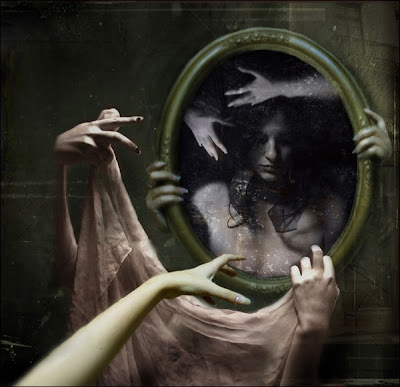 She pricked her finger with a gold needle and trailed it across her Mirror, tying the enchantment. Within the reflection, Snow White’s ruby mouth opened in a silent scream. Elidia reached for her face cream, the taste of success on her lips.